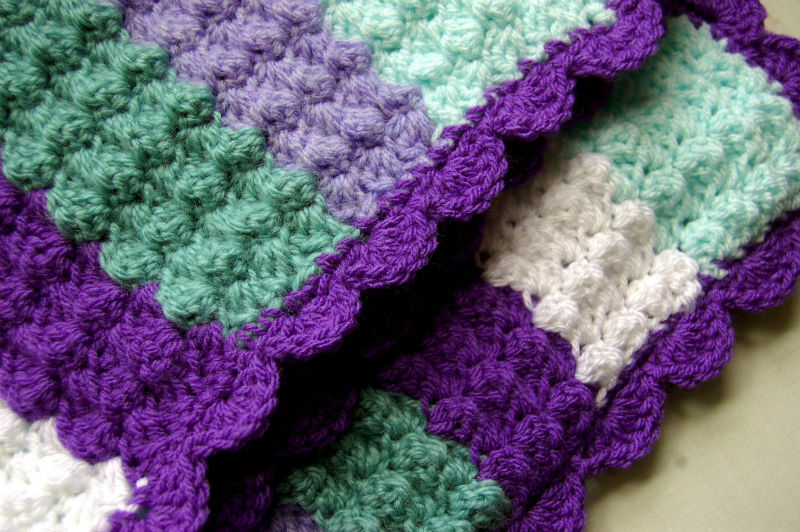 If you are new to crochet and want to have a go at practising the basic stitches while following a pattern – then this is a little project for you. 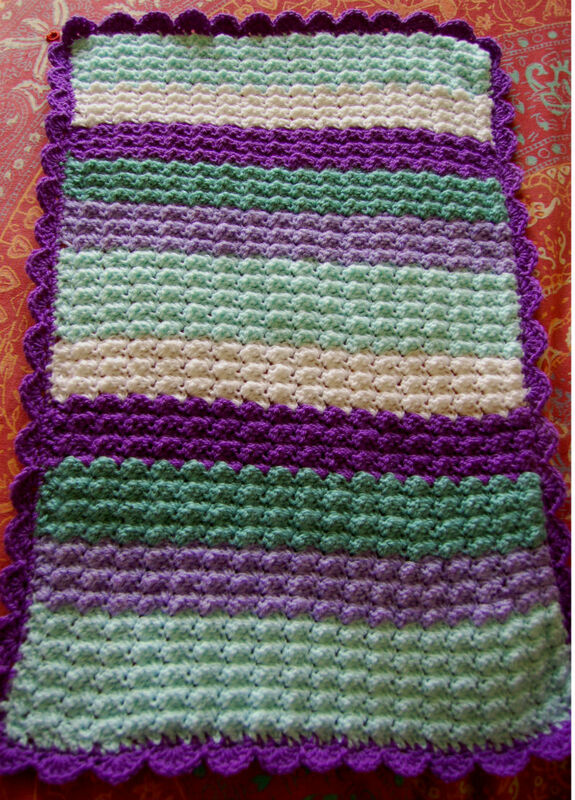 This cotton baby cloth uses the first techniques and stitches you need to master; chain, double crochet, trebles and slip stitch. 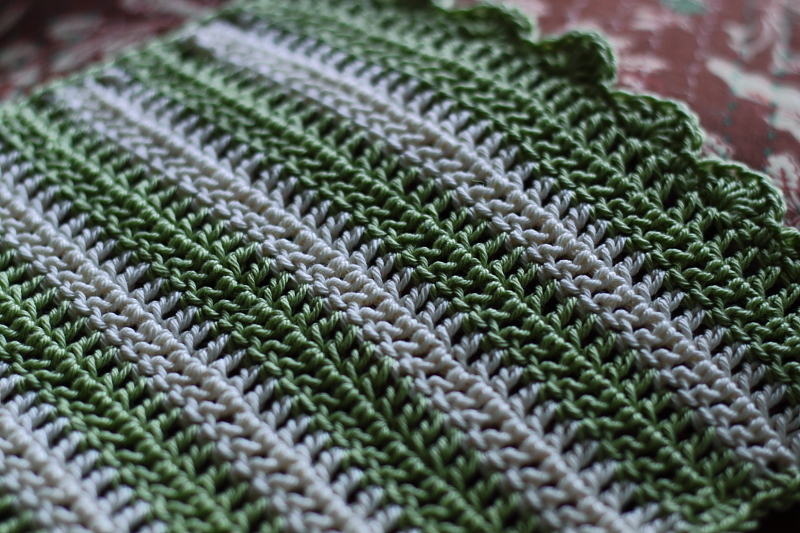 It also introduces the shell stitch for edging. 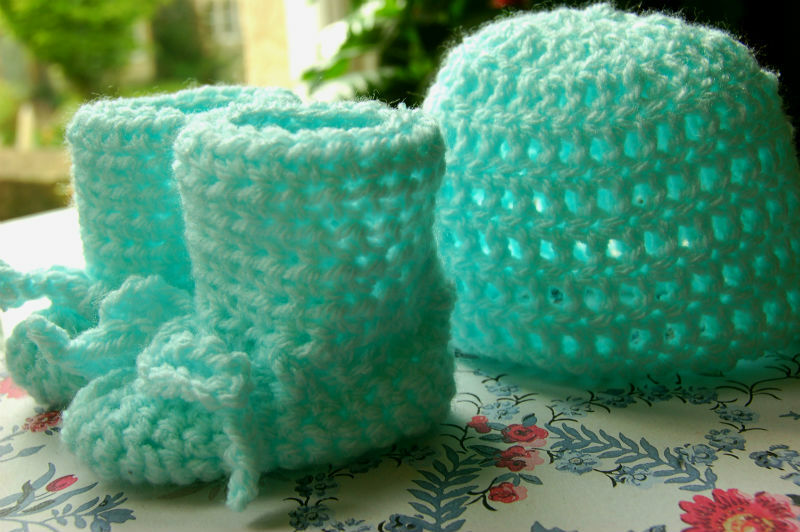 It is simple to make in a couple of evenings and can be used for your baby or around the house. ch chain; dc double crochet; ss slip stitch; rep repeat; st(s) stitch(es). Yarn: double knitting – cotton, in two colours of your choice (less than 25g of each). Foundation row, 35ch, plus 1ch. Round 2-3: 2ch, 1trb into each st to end. Round 4-5: Change colour then repeat rows 2-3. Continue for another 8 rounds (each round being 2 rows of each colour), until you have 5 rows in one colour and 5 in the other (20 rows in total). This makes a square cloth. Rejoin first colour to bottom right hand corner. 1 ch, then 1dc in each stitch up the right hand vertical edge, picking out even spaces to crochet 40dc into. 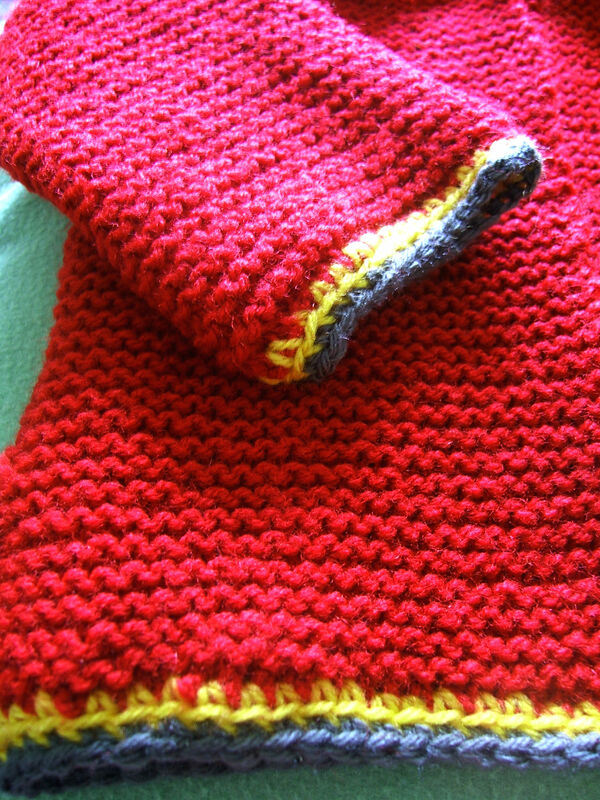 Turn the corner to begin the shell stitch edging along the top. 1dc into first st. * Miss 1 st, 6 trb into next st (trebles will fan around to make shell shape). Miss 1dc, ss into next st.
Repeat from * to end of edge. You will form 8 shell shapes. End with a ss from the final shell, before you turn the corner to work down the left vertical edge. 1ch, 1dc all down edge, picking out even spaces to crochet 40dc into. Turn corner, 1dc, then make 8 shell shapes along the bottom by following instructions for * as above. 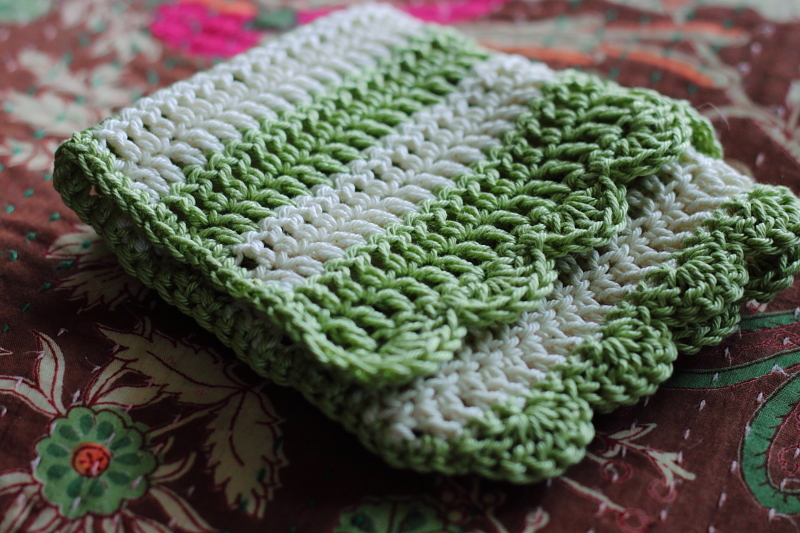 Getting to grips with crochet really is quite simple with a bit of practice. Once you have progressed beyond making a chain, then doing lines of double crochet or trebles to form a rectangle – many people ask me how to start making different shapes. So here are some simple instructions to help if you’d like to start making flat disks, spheres, ovals and sausage shapes – which come in particularly useful for creating little amigurumi creatures, like my mouse, or crocheted cat. They are also essential for making hats for babies! When working in rounds, the work continues with no turning, by joining a chain of stitches together to form a central ring. Start by reading these instructions from Crochet for Dummies to get you started if you’ve never done it before. This is how you’d start of when making things such as hats, toys and doilies for example. To make a flat circle, you need to increase in every row, by working two stitches into each stitch in the first row, then into every other stitch in the following row, every third stitch in the third row. Continue to increase using this format until the disk becomes as large as you want it. To make a sphere, like a ball to form the head of a toy, increase the diameter of the circle as above, then level off (by not increasing for a round), before beginning to decrease. You decrease by working two stitches together every other stitch in the following row, and every third stitch in the next row, until the hole closes in on the sphere. To make the fat end of an egg, increase in every stitch in the first row, every alternate stitch in the second row, every third stitch in the third row and every fourth in the forth row. Keep straight for one round, then decrease gradually as above, but with a straight row (by not increasing) between each decrease row. Similar to making a sphere, but after the initial increasing rows keep straight for the required length, then decrease rows as before. 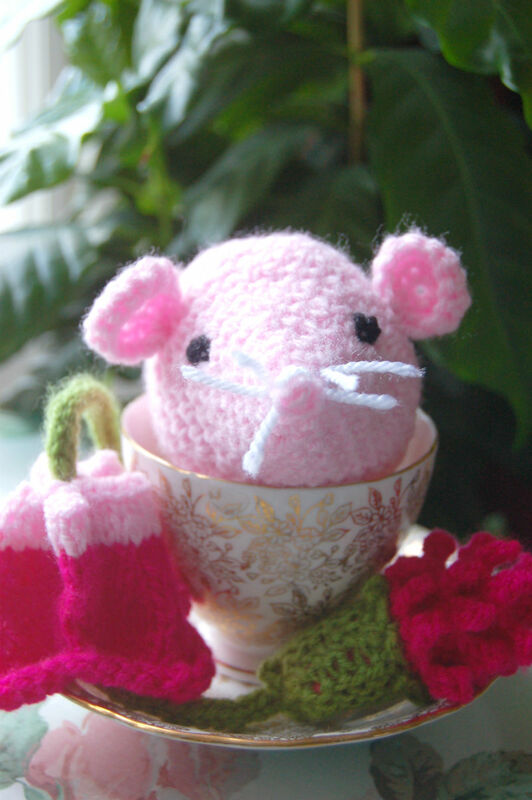 These instructions are adapted from some given in Amigurumi: 15 Patterns and Dozens of Techniques for Creating Cute Crochet Creatures. 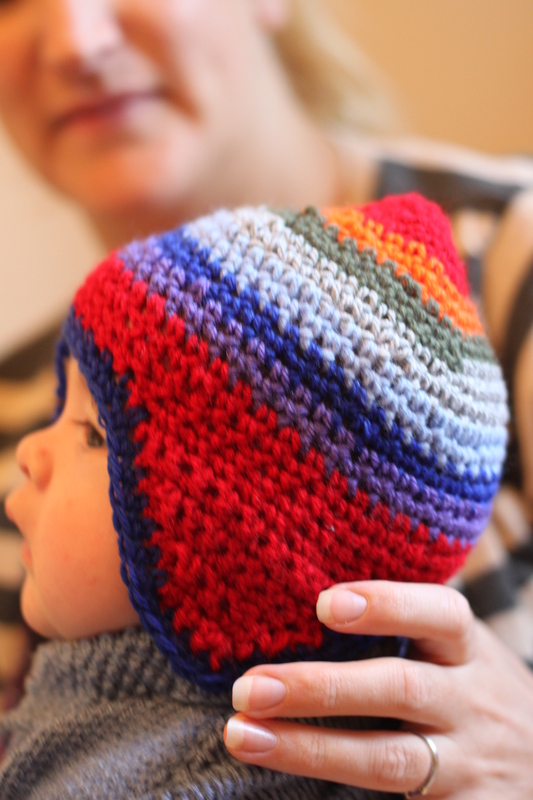 Quick and Easy Crochet Baby Hippy Hat modelled by Iolo! 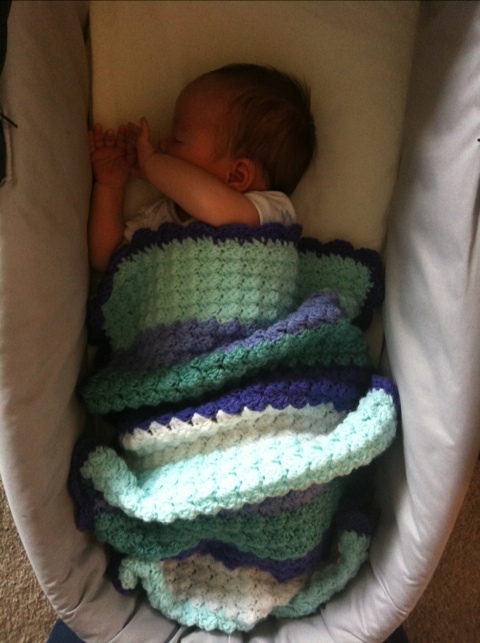 Having a baby is a perfect excuse to experiment with lots of new crochet projects. 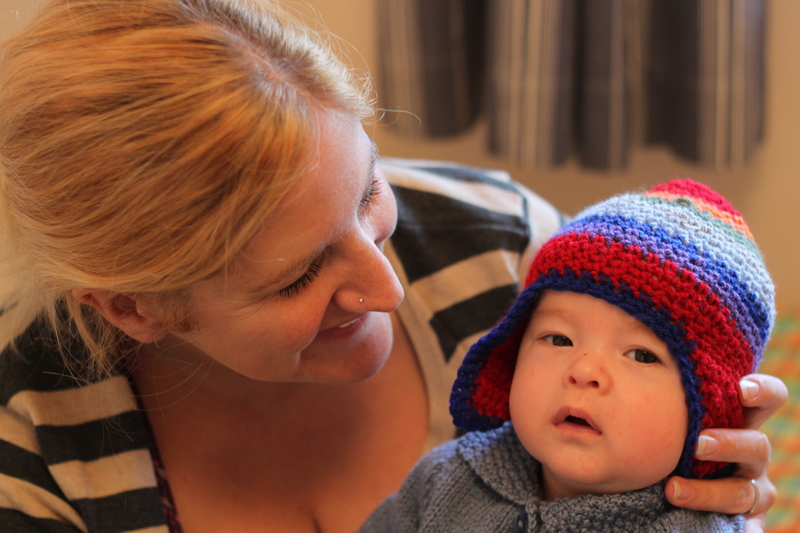 Months ago, I knitted Iolo a hat, which although is really nice, hardly fits him. All these amigurumi animals have led me to make lots of things based on circular patterns – which of course lend themselves to hats, particularly for babies! The weather is getting colder, so I decided to try to make him a new, larger hat, with little ear flaps. 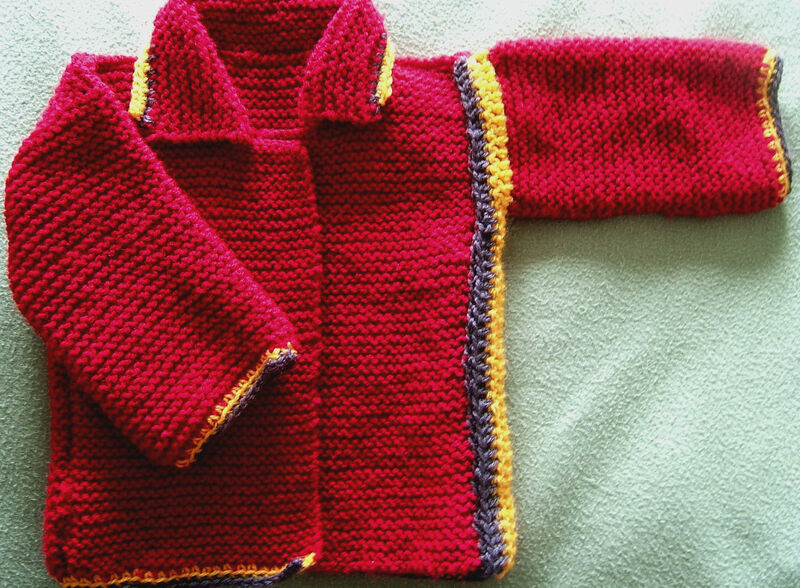 Here is the finished project and pattern. It’s cute and colourful. All a baby needs with one of these is a set of pan-pipes to complete the look (or so his grandad said!). I’m new to writing crochet patterns, so please contact me if there is anything you don’t understand. lotsofnicethingsblog@gmail.com. New to crochet? 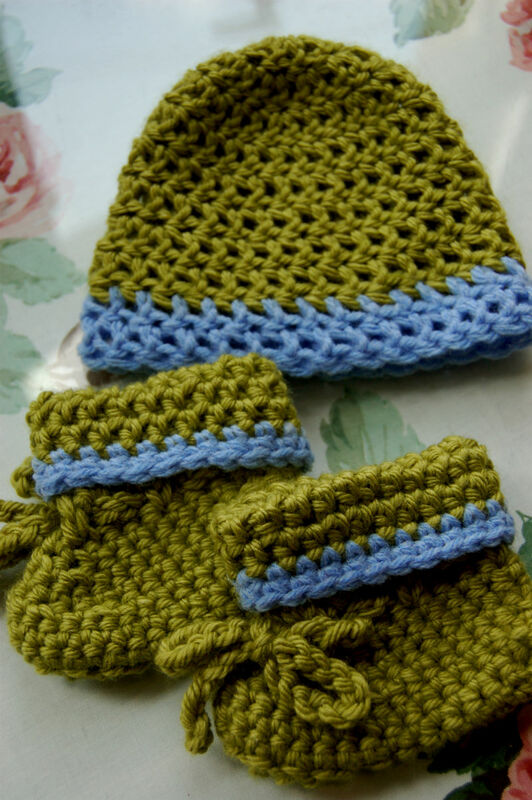 learn how to get started, making chain stitches and double crochet stitches. For this pattern, learn how to change colour. Key: ch chain; dc double crochet; dc2tog insert hook in st and draw up a loop. Insert hook in next st and draw up another loop. Yarn over, draw through all three loops on hook; rep repeat; st(s) stitch(es). Use a stitch marker to mark the start of each row, move it down as the work progresses. Yarn: Any colours in Double Knitting. I used (in this order) red, orange, green, grey, light blue, royal blue, purple, then back to red and royal blue to finish. To end a round: Join the last stitch into the first (of that round) using a slip stitch, before starting the next round. Make 2 ch in red. Round 1: 6dc in second ch from hook. Round 5: Change to orange. 1dc in each st (24 sts). Round 15: Change to purple. 1 dc in each st. (44 sts). Round 17: Change back to red. 1dc in each st. (44 sts). Round 18: 1dc in each st. (44 sts). Round 19: 1dc in 20 sts, dc2tog, 1dc in next 20 sts, dc2tog. 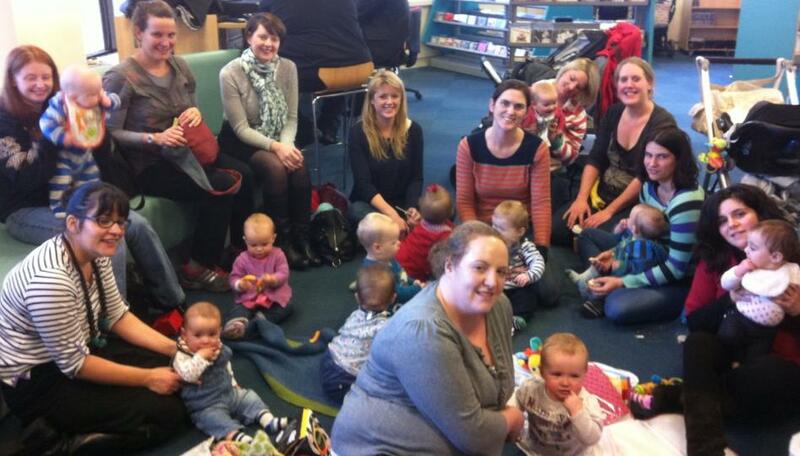 (42 sts). Round 20: 1dc in 19 sts, dc2tog, 1dc in next 19 sts, dc2tog. (40 sts). Fold left flap in half so front of hat faces you, with the flap to one side. 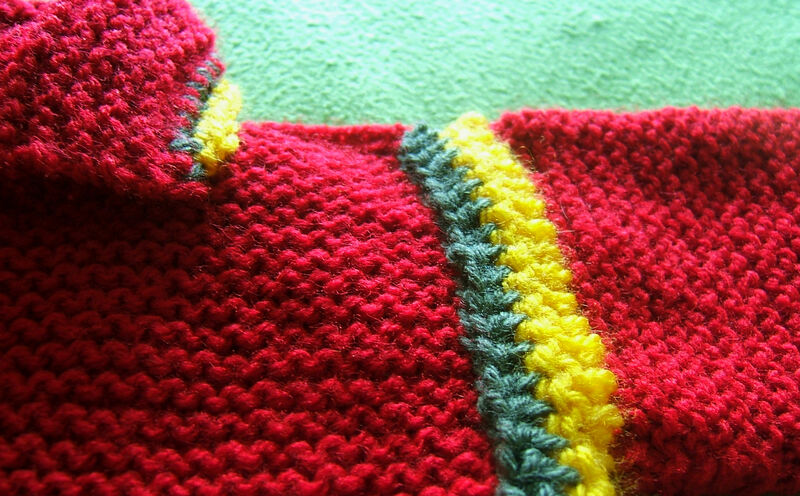 Count 10 stitches from top edge of left flap to re-join red yarn to crochet on the right flap, in a position equal to the left one. Round 30: Re-join yarn 10 sts along from end point of left flap. Repeat rounds 21-29. Fasten off. To finish off: Join the Royal blue to the bottom edge and dc in each st, all the way around, twice. Fasten off and sew in all the ends using a yarn needle. Like this pattern? subscribe to receive new patterns by email. See the box on the right hand side.